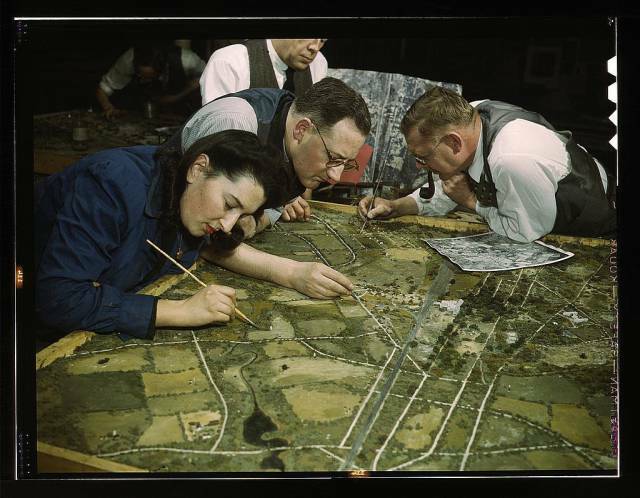 Amazing colorized photos that show how Americans were preparing for the WWII at home. 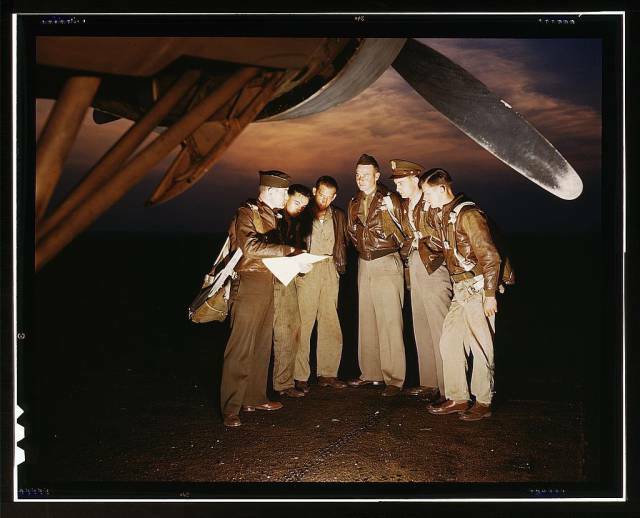 A combat crew receives final instructions just before taking off in a YB-17 bomber from a bombardment-squadron base at Langley Field, Virginia, May 1942. 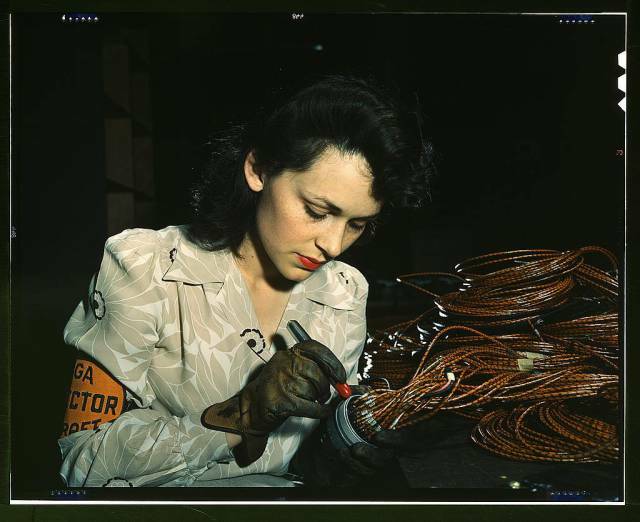 A woman aircraft worker at Vega Aircraft Corporation, Burbank, California, shown checking electrical assemblies in June 1942. 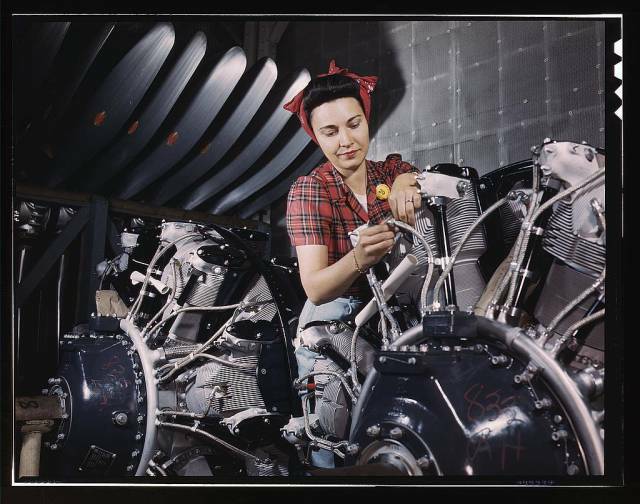 A woman working on an airplane motor at a North American Aviation Inc. plant in California, June 1942. 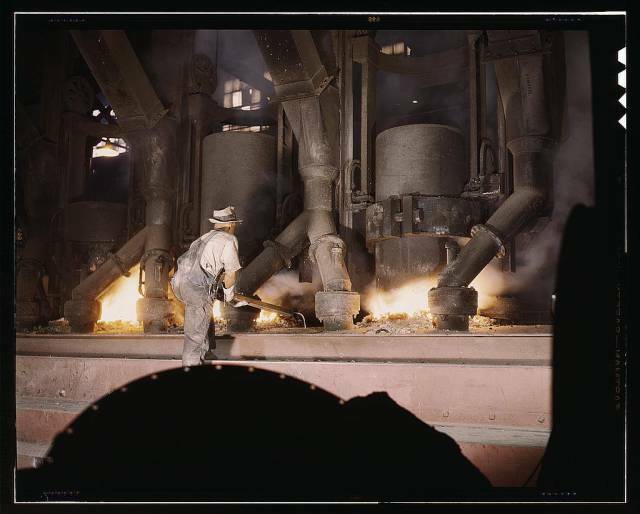 A TVA chemical-plant electric furnace loaded with phosphate, in the vicinity of Muscle Shoals, Alabama, June 1942. 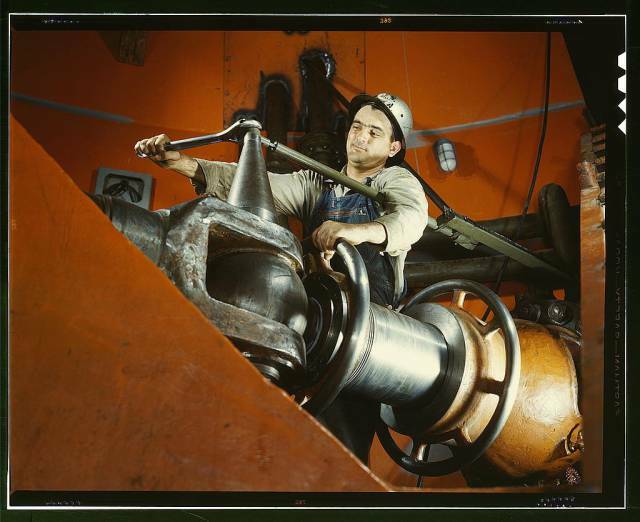 A worker tightening a nut on a guide-vane-operating seromotor in the TVA's hydroelectric plant at Watts Bar Dam, Tennessee. Located 530 miles above the mouth of the Tennessee River, the dam had an authorized power installation of 90,000 KW, which could be increased to a possible ultimate of 150,000 KW. The reservoir at the dam added 370,000 acre-feet of water to controlled storage on the Tennessee River system, June 1942. 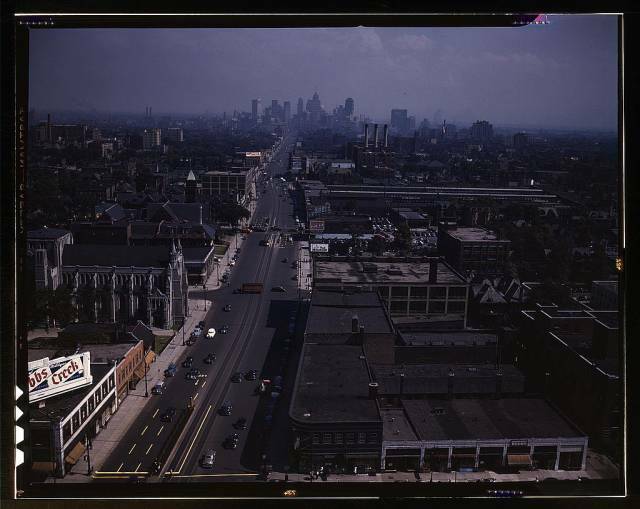 Looking south from the Maccabees Building with the Detroit skyline in the distance, Detroit, Michigan, July 1942. 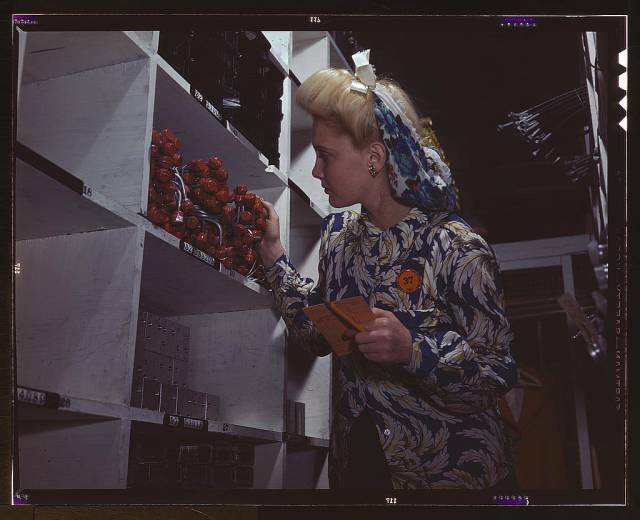 A clerk in one of the stock rooms of North American Aviation Inc. checking to see if the proper numbers of parts were received and placed in the proper bin, Inglewood, California, October 1942. This plant produces the battle-tested B-25 ("Billy Mitchell") bomber, used in General Doolittle's raid on Tokyo, and the P-51 ("Mustang") fighter plane that was first brought into prominence by the British raid on Dieppe. 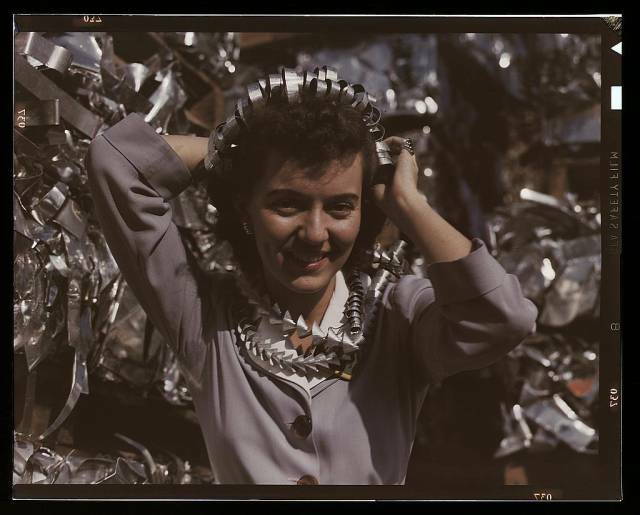 Annette del Sur publicizing a salvage campaign in a scrap yard of Douglas Aircraft Company, Long Beach, California, October 1942. 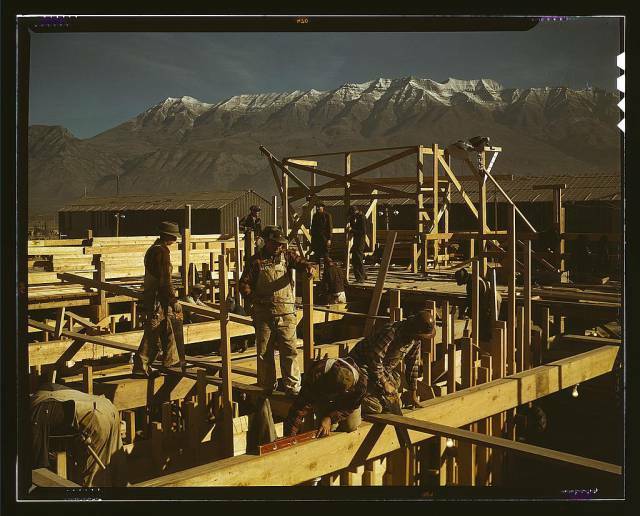 Constructing a building on the site of a new steel mill that would soon turn out steel for the war needs, Columbia Steel Co., Geneva, Utah, in November 1942. 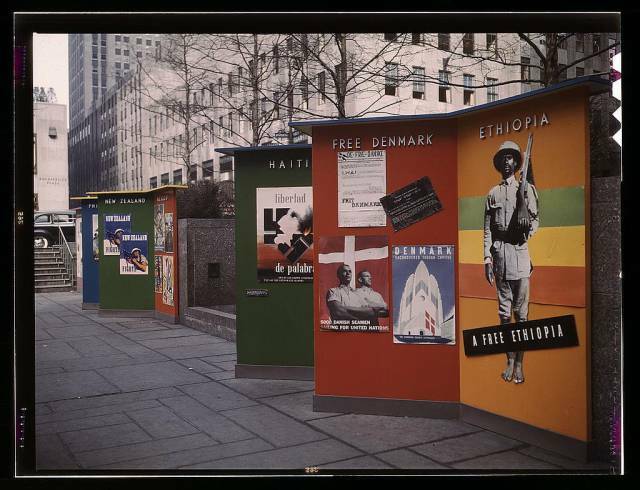 An UN exhibit by the US Office of War Information at Rockefeller Plaza in New York City. Between photographic displays is the Atlantic charter in frame with transmitters at each end and where the voices of Roosevelt, Churchill, and Chiang Kai-Shek are heard each half hour, surrounded by statues of the four freedoms, March 1943. 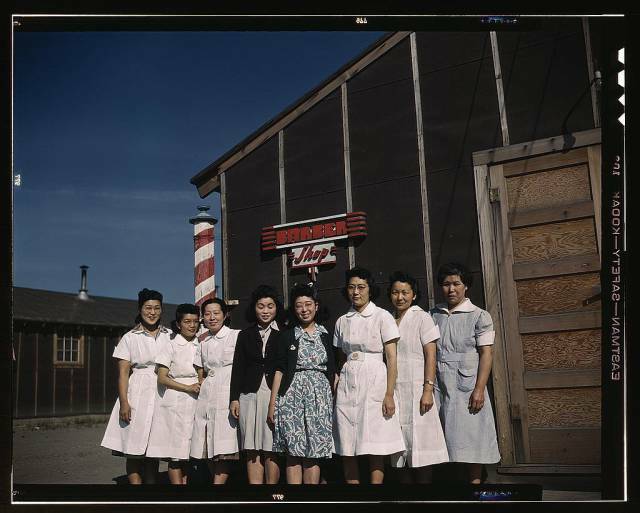 Japanese-Americans at Tule Lake Relocation Center, the only internment camp designated as a "segregation center," in Newell, California, sometime in 1942 or 1943. 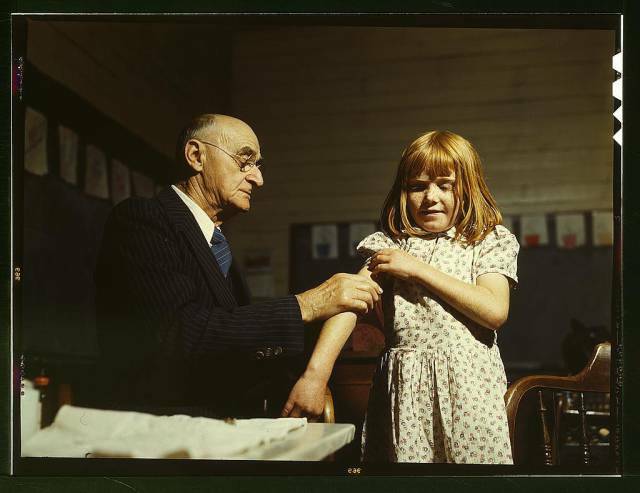 Dr. Schreiber of San Augustine giving a typhoid inoculation at a rural school, San Augustine County, Texas, April 1943. 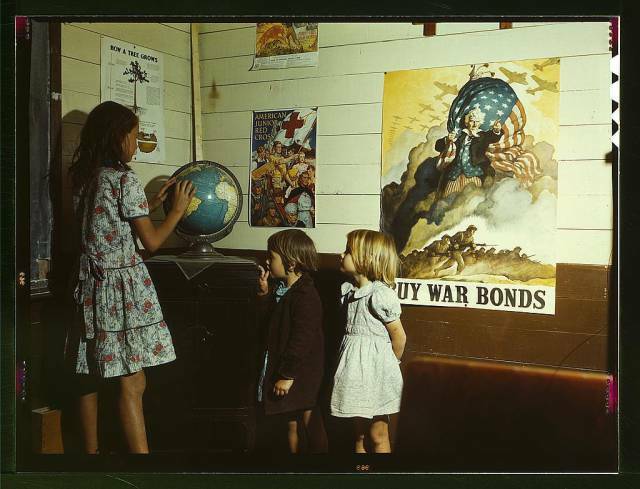 Rural school children in San Augustine County, Texas, in April 1943. 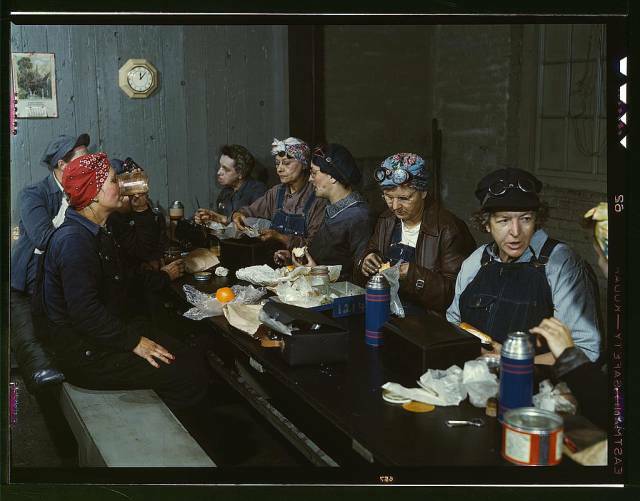 Women workers employed as wipers in the roundhouse having lunch in their rest room at Chicago & Northwestern Railway, Clinton, Iowa, April 1943. 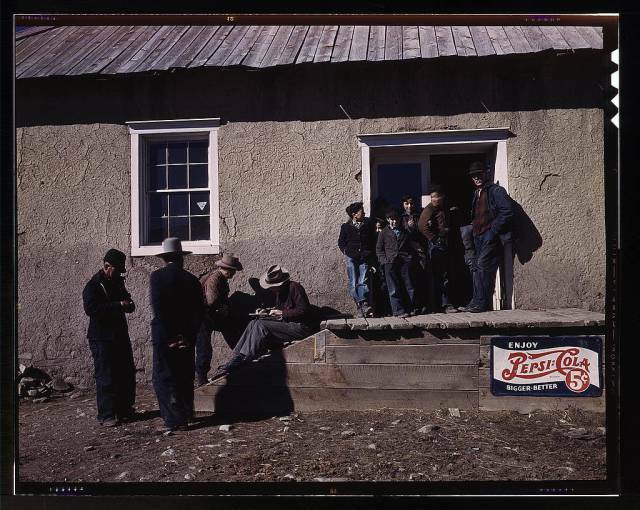 A general store in Chacon, New Mexico, in spring 1943. 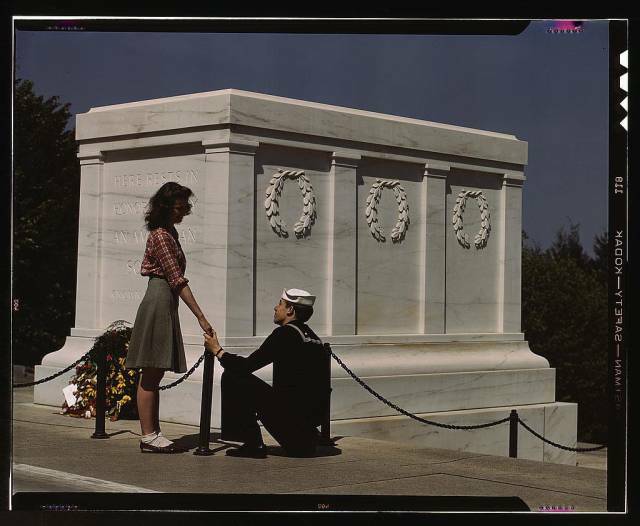 A sailor and a girl at the Tomb of the Unknown Soldier, Washington, DC, May 1943. 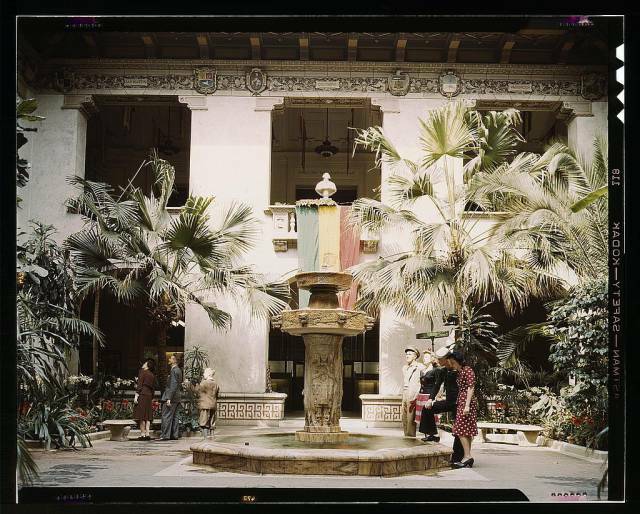 The courtyard of the Pan American Building, Washington, DC, May 1943. 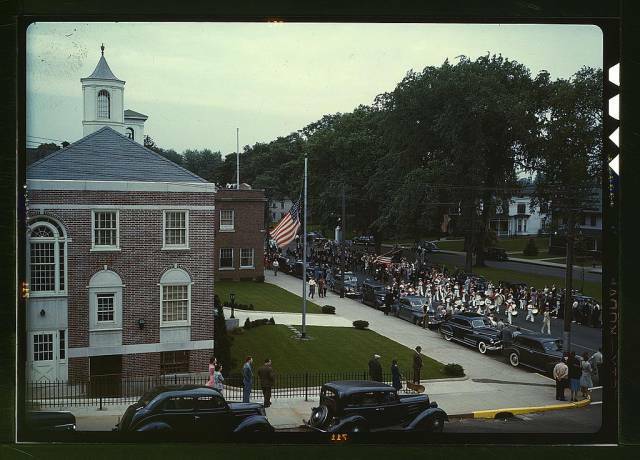 An American town and its way of life, Southington, Connecticut, May 1943. The Memorial Day parade is moving down the main street. The small number of spectators is accounted for by the fact that the town's war factories did not close. The town hall is in the left foreground. 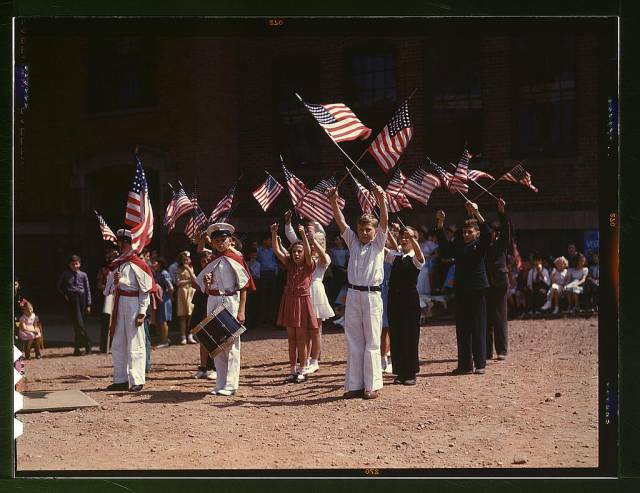 Children stage a patriotic demonstration, Southington, Connecticut, May 1943. 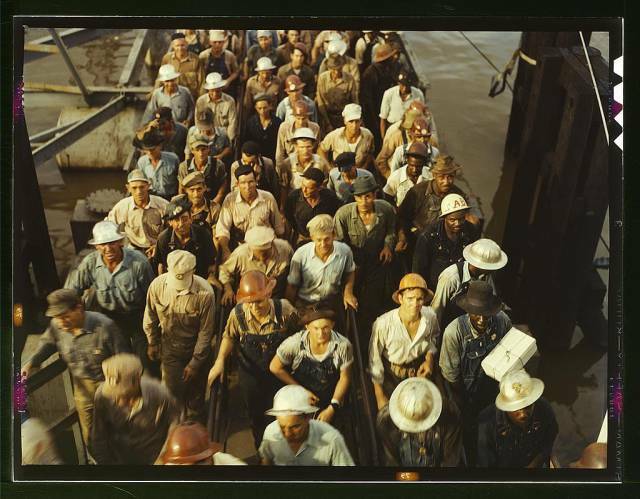 Workers leaving Pennsylvania shipyards in Beaumont, Texas, June 1943.